Trump tweeted shortly after Myeshia Johnson, the widow of Sgt. La David Johnson, discussed her disappointment with the call on “Good Morning America” Monday morning, saying the President stumbled on her husband’s name and suggesting the only reason he knew it was because the report was right in front of him. 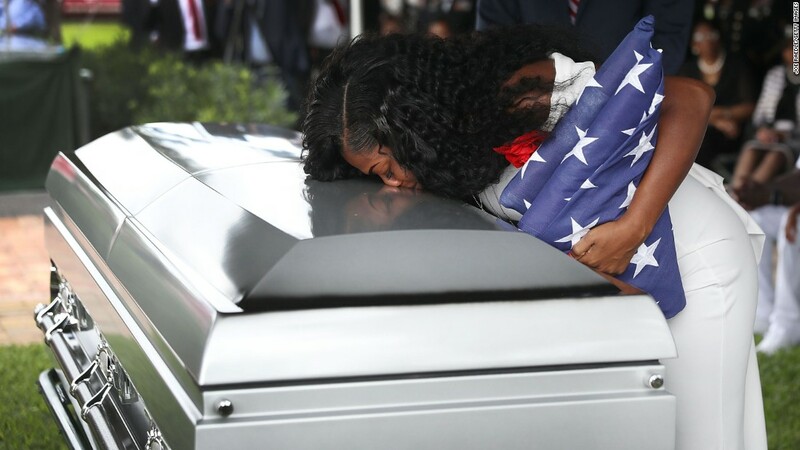 Johnson said she was distraught over Trump’s alleged oversights during the call, which came as the Johnson family and Rep. Frederica Wilson, D-Florida, who is a friend of the family, rode in a limo to receive Johnson’s body from Dover Air Force Base. “(The call) made me cry because I was very angry at the tone of his voice,” she said. When host George Stephanopoulos asked if she had anything to say to the President, Johnson was direct. “No. I don’t have nothing to say to him,” she said. There are currently no plans for the administration to reach out to Sgt. Johnson’s family again, a White House official said. The White House offered no additional comment. Wilson and Trump have traded barbs for nearly a week on the controversy stemming from the President’s condolence call to Johnson. Wilson claimed that the President said Johnson “knew what he signed up for, but I guess it still hurt.” The family member who raised Johnson has called Wilson’s account of the call “very accurate” and the White House has not refuted that Trump spoke those words. Johnson’s GMA appearance comes during a swirling political debate over the circumstances of the death of her husband and three other US soldiers in Niger. Johnson, who is expecting a daughter this January, saidshe’s still waiting for answers regarding the circumstances of her husband’s death. She says she’s gotten no answers from the government about how or where her husband died and says they refused to let her view his body. “They won’t show me a finger, a hand. … I don’t know what’s in that box,” she said. CNN’s Kaitlan Collins contributed to this report.